Shame on Argentina officials/zoo for having forced Arturo to live in this hell hole for so long!! 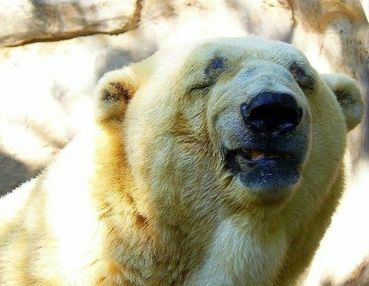 You have already signed the petition "Please allow Arturo to have a better life in the Assiniboine Park Zoo in Canada"
> already signed the petition "Please allow Arturo to have a better life in the Assiniboine Park Zoo in Canada"
Done - a rescue team needs to go in and remove him from this horrific place. What barbaric monsters are these to keep this poor animal in these horrendous conditions. This has been going on for way too long, its time we animal activists took the law into our own hands and rescued him instead of waiting on numerous petitions to be signed while he is suffering day in and day out. Already signed this petition. My heart is breaking for Arturo. Now zoo officials say that Arturo would not survive the two trip to Canada. Well, maybe dying while under anesthesia would be better for Arturo than letting him suffer any longer in the hell that he is in now. Poor bear! maybe us at care2 can help! This is an incredibly stupid and cruel way to keep a polar bear in captivity. At a minimum, he should have been provided with a better habitat. The story confirms my deeply held conviction that zoos are little more than prisons. No healthy animal capable of surviving in the wild should ever be held in a zoo. Argentina came second in World football,show the world that you can be first in compassion and release this poor lonely Bear held in horrific conditions for a life time.Send him home to live his last years,days,hours in his own environment and to enjoy and KNOW the feeling of FREEDOM. PLEASE. This poor creature is already living a miserable living death, if asked 'do want to take a chance' and he could answer we all know what that answer would be, at least give him a chance to spend the rest of his life in comfort where his needs are seen to. This is a desperate situation and desperate measures have to be taken to give this living being his twilight years in peace in an environment as close as possible to that which he deserves. Signed, noted. It makes me Burn hot that Arturo is so poorly treated! He is not valued in Argentina- he needs to be moved somewhere MUCH Cooler, and he needs a lift in spirit (a new companion, perhaps ?) He will not be freed,ever: he should at least live in a place he is well-cared for!..........................................I signed the petition. Already signed but we need MANY MORE SIGNATURES to FREE Arturo!! Petition signed. Thank you. Poor Arturo. Signed & noted. Thank you, Kelly. So glad to see so many supporters signed on to this! signed Change petition. I don't facebook anymore. again proof animals don`t belong i a zoo or circus shame for such poor preforming care! signed. This is so sad! Signed (with statement) and shared. Shame on them for making Arturo suffer so much! !